In March 2018, Ferris Coin Co. announced a nation-wide competition to design a 1 ozt. 39 mm silver round commemorative medal honoring African American World War I hero Sgt. Henry Johnson to be struck on the 100th anniversary of his May 15, 1917 act of valor in the Forest of Argonne, France. The contest attracted submissions from across the U.S., including work by several artists whose designs appear on many coins produced by the U.S. Mint. Entries were evaluated by an expert jury composed of esteemed professional artists and a representative of the 369th Veteran's Association. No identifying information was included in the submission materials presented to the jury. Though the jury was free to select any combination of obverse and reverse designs by any artists, the panel selected a single artist's designs fro both sides. They felt that artist Chris Costello best captured the spirit of Sgt. Henry Johnson's self-less sacrifice for his country and for his fellow soldiers, and that his message best reflected the spirit of the annual Henry Johnson Day and Henry Johnson Award for Distinguished Community Service, awarded by the City of Albany, N.Y. in partnership with the 369th Veteran's Association Inc. Albany District. Ferris Coin Co. donated silver medals to the 369th for the annual award. Photo: Obverse Sgt. Henry Johnson .999 silver round, 1 ozt., as packaged with 4" x 6" plastic laminated color cardstock with embedded 39mm capsule. 500 limited minting with serial number. Photo: Reverse Sgt. Henry Johnson .999 silver round, 1 ozt., as packaged with 4" x 6" plastic laminated color cardstock with embedded 39mm capsule. 500 limited minting with serial number. Chris Costello, left, signs Sgt. Henry Johnson commemorative package for Albany veterans of the 369th Regiment during the premiering event at The Palace Theatre, July 23, 2018. Chris Costello is a professional graphic designer, illustrator, typographer and Artistic Infusion Program Artist for The United States Mint. He has created illustrations and custom lettering for clients including Random House, Simon and Schuster, Oxford University Press and HarperCollins. His work consistently receives awards for design excellence and has been published in Graphic Design USA awards annuals. Mr. Costello has created several original font designs and his popular font, Papyrus, is included with Apple and Microsoft operating systems. As a fine artist, he enjoys drawing and painting historic architecture, landscapes, portraits as well as sculpting in clay and plaster. Since 2010, Chris has submitted drawings to over 45 United States Mint design programs and was awarded the honor of having his original artwork appear on 23 U.S. coins and medals including one Congressional Gold Medal. Jahkeen Hoke, winner of the second annual Henry Johnson Award for Distinguished Community Service, received a silver commemorative Sgt. Henry Johnson medal along with a certificate and a monetary reward. See: "Albany marks 2nd Annual Henry Johnson Day," Times Union, June 5, 2018. On June 5, 2018, the City of Albany, N.Y. celebrated its second annual Henry Johnson Day, marked by a ceremony that included bestowing of the Henry Johnson Award for Distinguished Community Service. The date was selected because it is the date upon which Johnson enlisted. The new Henry Johnson coin-shaped medal was granted as part of the award. Through the Distinguished Community Service Award contest, members of the community nominate their peers who have made outstanding contributions to the community in the areas of arts and history, social justice, education, or community organizing. The purpose of the award is to recognize an individual who has gone above and beyond the call of duty but has not received formal recognition or public thanks for their actions. Ferris Coin Co. donated 10 silver medals to be presented to the winners of the Henry Johnson Award for the next decade. This year’s winner, the first to receive a medal, was Jahkeen Hoke. (During the June 27, 2018 premiere James Dandles, the first winner of the Henry Johnson Award, was presented with a Sgt. Henry Johnson medal with the serial number 369. The number is significant as both Johnson and Dandles served in the 369th Regiment). The remaining medals are available to the public for $29.95 exclusively online and at Ferris Coin Co., located at 199 Wolf Road in Albany. Ferris Coin Co. is proud to donate $2 from each sale of the medal to the 369th Veterans Association Albany District to continue their support of the annual Henry Johnson Award. Ferris Coin Co. is grateful to our expert jury who evaluated nearly five dozen contest design entries to select the winning designs for the Sgt. Henry Johnson silver commemorative medal. Contest jury members Ferris Coin Co. partners, veterans of the 369th, Jahkeen Hoke, and artist Chris Costello during the June 27 premiere of the Sgt. Henry Johnson silver medal. There were more than five dozen submissions to Ferris Coin Co.'s nationwide contest to design the Sgt. Henry Johnson silver round commemorative medal. Artists from around the country submitted incredible designs. Pictured above is a poster displayed during the June 27 premiere. Sgt. 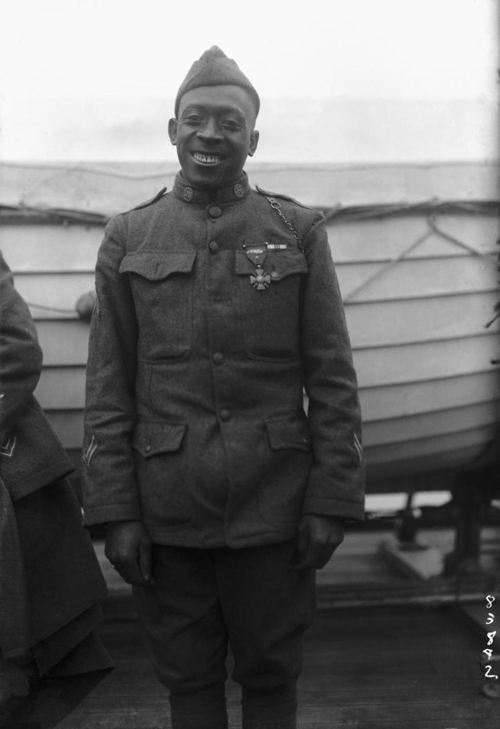 Henry Johnson circa 1919, wearing his Croix de Guerre. On June 5, 1917, Albany resident Henry Johnson enlisted in the first African American unit in the U.S. Army to engage in combat in World War I. In May 1918 Johnson heroically fought off a German raid in hand-to-hand combat, saving the life of a fellow soldier. For his bravery, Johnson received France’s highest award for valor, becoming the first American to receive this distinction. Sgt. Johnson returned to Albany in 1919. Despite having been wounded 21 times, he received no honors from his home country. He died, destitute, in 1929, in his mid-30s. He is buried in Arlington National Cemetery. Sgt. Henry Johnson was finally recognized by the United States government for his service to his country when he was posthumously awarded the Purple Heart in 1996 and the Distinguished Service Cross in 2002. In 2015 he was awarded the National Medal of Honor – the nation’s highest military honor – by President Barack Obama. This commemorative coin-shaped medallion offers an opportunity for our nation to recognize the 100th anniversary of Sgt. Henry Johnson’s act of valor, and to honor the spirit of service to community. Note: Johnson's regiment — the 369th Infantry Regiment, formerly known as the 15th New York National Guard Regiment, also known as the “Harlem Hellfighters”— wore the French Adrian helmet, not the Brodie helmet (or doughboy helmet). Medal of Honor posthumously awarded to Sgt. Henry Johnson by President Barack Obama in 2015, on display at the NYS Capitol building.